My Father loves clocks and anything that reports the temperature (and other weather related info). So for Xmas I built this little piece to add to his collection. It uses a DS1307 with backup battery to track time, and a LM35 for recording the temperature. 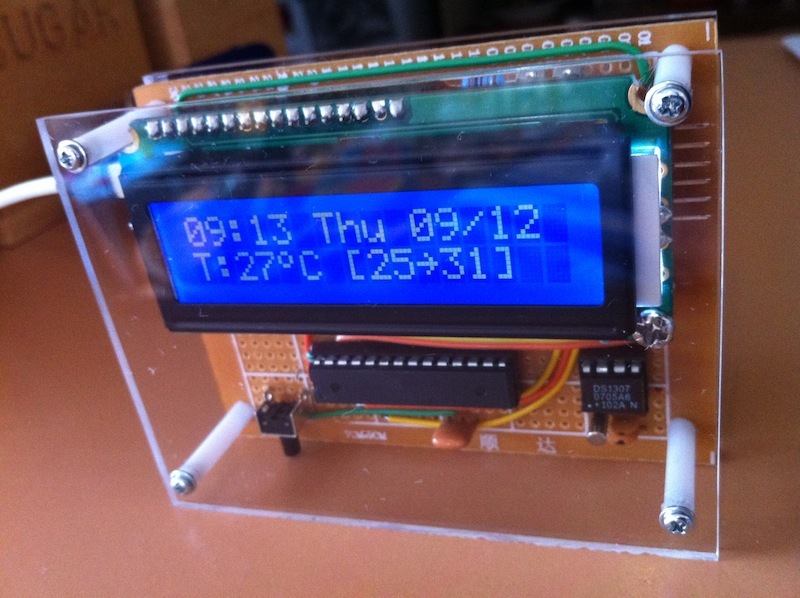 The LCD displays time, date, current temperature and min and max recorded temperatures (which are backed up in EEPROM). The button at the bottom of the board is used to reset the min/max values. Also I included a serial connection so the sketch can be updated, and also a little serial protocol so the time can be adjusted if required. I used an iPod power supply for nice clean 5V supply - which I modded to use a 2-pin connector to attach to the board. I also added a bunch of canned messages for specific dates, Xmas, NY, birthdays etc. Finally presented it to him along with a laminated version of the schematic I created. He loved it! Next version I'm thinking more weather info (humidity and baro pressure probably), and using nixies for the display instead of boring old LCD. The perspex front finishes it off nicely. Wow very cool! You would perhaps add a ambient light sensor to control the back light state (to save power during the day). Would you mind sharing your code and/or schematic? I love that it records the max/min temps, and it looks great. I've just remembered, it can tick as well. I put a relay in it which flips every second. There's a switch to turn it off though, it's a bit annoying. 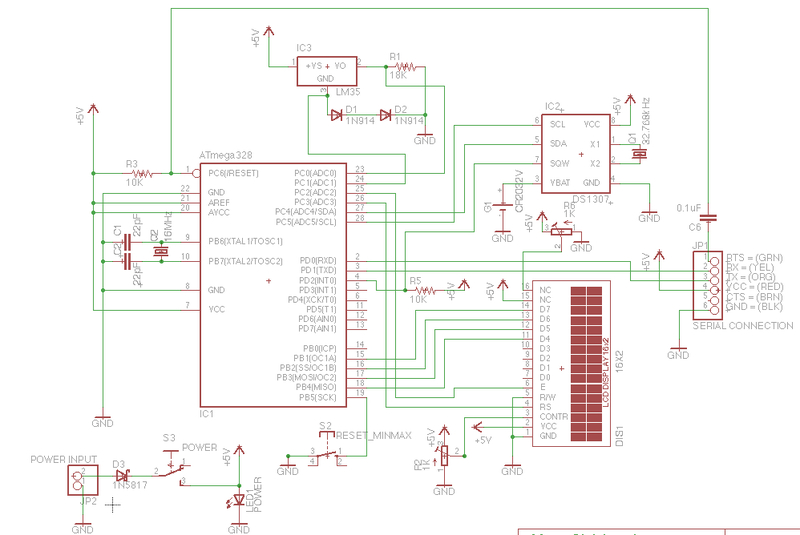 You know there's EEPROM onboard the 168/328 chips right? That's what I used as I'm not logging historical data, just a few bytes for the min and max values. The back on my unit above is visible through perspex as well - I tried to be nice and neat with the point to point soldering. Will post a pic of that plus my schematic later (it's at home). You might want a relay per digit as they're relatively slow. I initially had the digits change in a cascade style and wanted to click the change but found the relay wasn't up to it. I'd entirely forgotten about the onboard eeprom! Ta for the reminder. Ta for mentioning cathode poisoning too, I hadn't heard of that and Iv'e just got myself a set of nixies. 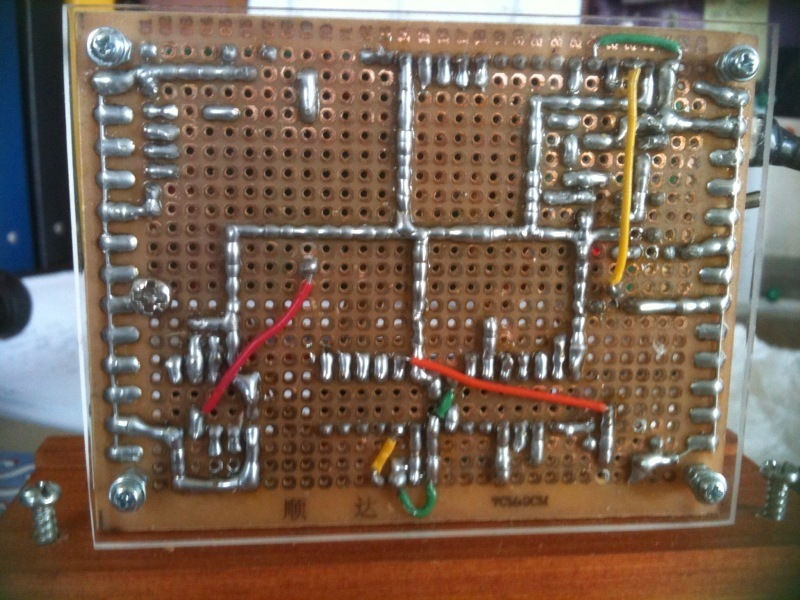 Thanks for the schematic and pictures. Would you mind posting your source code as well? If you'd prefer to keep it closed-source that's totally understandable. Keep up the good work! // DS1307 1Hz pulse ISR - set our flag and get out! // Get the current time and display Xmas Card if it's Xmas! // We loop around here whilst ever we have power! // Time to update the time? // Any input to process? // time to update the temp reading? // Take a reading from the sensor. We actually take multiple and average them. Note I started implementing a calibration mechanism but haven't completed that yet.